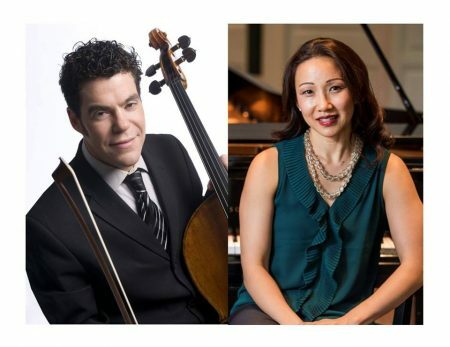 Praised for his “consummate musicianship” (Fanfare Magazine) and “commanding technique,” (Nashville Scene) cellist Michael Samis will perform in a Guest Artist Recital with pianist Emily Yap Chua at Randolph on Friday, October 19. The concert begins at 7:30 p.m. in Wimberly Recital Hall, inside Presser Hall, and is free and open to the public. For the concert, Samis and Chua will perform well-known works by Bartók and Beethoven as well as new favorites by Mexican composer Manuel Ponce and British composer Dame Ethel Smyth. In addition to the Guest Artist Recital at Randolph, Samis will present outreach performances for Lynchburg City Schools string students and at Miriam’s House, and meet with students in the B.F.A. colloquium at Randolph. A recent article in Fanfare Magazine praised Samis as being “in the very highest echelon of the world’s living cellists.” Samis is principal cellist for the Nashville Opera Orchestra and co-principal of the Grammy-nominated Gateway Chamber Orchestra, and has given recitals around the world. He was recently featured on Stopping By, a Delos Productions CD recorded with tenor Kyle Bielfield and pianist Lachlan Glen. In 2007, he recorded a CD on the Ottimavoce label with soprano Karen Parks, Nobody Knows: Songs Of Harry T. Burleigh. He also frequently performs on National Public Radio affiliate WPLN’s “Live in Studio C” program. In 2013, Samis was awarded a Tennessee Arts Commission Individual Artist Fellowship in Music for Solo Instrumental Performance. He graduated from the Cleveland Institute of Music in 1999 with the Ellis A. Feiman Award in Cello.